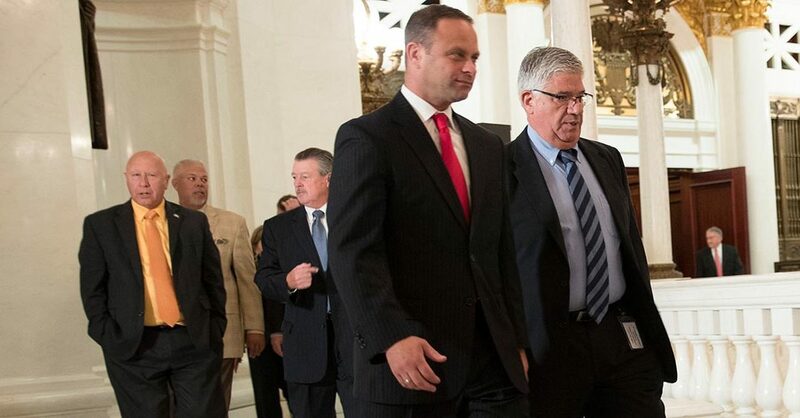 Harrisburg, September 28, 2016 – Senator Sean D. Wiley (D-Erie) listened intently today as Governor Tom Wolf addressed a joint session of the Pennsylvania General Assembly, sharing with members of both the House and the Senate his priorities in tackling the heroin and opioid crisis gripping the Commonwealth. Wolf outlined the increase in the 2016/2017 Commonwealth budget of $20 million for treatment centers, creating 45 centers and providing access to nearly 11,000 Pennsylvanians to receive care. One of those centers is the Esper Treatment Center in downtown Erie, recently awarded the aforementioned Center of Excellence designation by the Governor. Additionally, the Governor shared the bi-partisan effort to create the Prescription Drug Monitoring Program, a mechanism to allow prescribers and pharmacists to monitor who is accessing opioids, how they were prescribed and how often. Wolf also championed the use of Naloxone, an opioid overdose reversal medication, as it has saved 1,500 lives across Pennsylvania alone in 2016. Most law enforcement and first responders in the Commonwealth now carry Naloxone under Act 139 of 2014 and a standing order issued by Pennsylvania Physician General Dr. Rachel Levine. “It is understood that the administration of Naloxone is not the answer to ending the heroin and opioid addiction crisis, but rather is an opportunity for that person to have another chance at recovery,” added Wiley. Throughout 2015 and 2016, Senator Wiley has hosted a number of Naloxone trainings in the Erie area open to all interested community members where the Department of Health required training was provided by a licensed physician to those in attendance as well as a Naloxone kit to take-home. These events were incredibly well attended and left the greater Erie public asking for additional events in the future. Moving forward, the Governor charged the General Assembly with the task of advancing a number of opioid specific efforts. Governor Wolf also highlighted a proposed limit for those under 18 who are prescribed opioids to a seven-day supply with no refills. “We have heard too many horror stories about high school athletes whose futures are robbed by addiction that begins with prescription painkillers,” said Wolf.